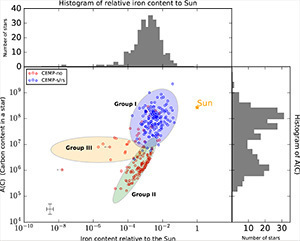 The figure shows a sub-population of ancient stars, called carbon-enhanced metal-poor stars. The unusual chemical compositions of these stars provides clues to their birth environments. A( C) is the absolute amount of carbon, while the horizontal axis represents the ratio of iron, relative to hydrogen, compared with the same ratio in the Sun. Click for larger size. University of Notre Dame astronomers have identified what they believe to be the second generation of stars, shedding light on the nature of the universe’s first stars. A subclass of carbon-enhanced metal-poor (CEMP) stars, the so-called CEMP-no stars, are ancient stars that have large amounts of carbon but little of the heavy metals (such as iron) common to later-generation stars. Massive first-generation stars made up of pure hydrogen and helium produced and ejected heavier elements by stellar winds during their lifetimes or when they exploded as supernovae. Those metals — anything heavier than helium, in astronomical parlance — polluted the nearby gas clouds from which new stars formed. Jinmi Yoon, a postdoctoral research associate in the Department of Physics; Timothy Beers, the Notre Dame Chair in Astrophysics; and Vinicius Placco, a research professor at Notre Dame, along with their collaborators, show in findings published in the Astrophysical Journal this week that the lowest metallicity stars, the most chemically primitive, include large fractions of CEMP stars. The CEMP-no stars, which are also rich in nitrogen and oxygen, are likely the stars born out of hydrogen and helium gas clouds that were polluted by the elements produced by the universe’s first stars. Beers says it’s unlikely that any of the universe’s first stars still exist, but much can be learned about them from detailed studies of the next generation of stars. The authors used high-resolution spectroscopic data gathered by many astronomers to measure the chemical compositions of about 300 stars in the halo of the Milky Way. More and heavier elements form as later generations of stars continue to contribute additional metals, they say. As new generations of stars are born, they incorporate the metals produced by prior generations. Hence, the more heavy metals a star contains, the more recently it was born. Our sun, for example, is relatively young, with an age of only 4.5 billion years. A companion paper, titled “Observational constraints on first-star nucleosynthesis. II. Spectroscopy of an ultra metal-poor CEMP-no star,” of which Placco was the lead author, was also published in the same issue of the journal this week. The paper compares theoretical predictions for the chemical composition of zero-metallicity supernova models with a newly discovered CEMP-no star in the Milky Way galaxy. Originally published by Brian Wallheimer at news.nd.edu on December 06, 2016. Full caption for image: The figure shows a sub-population of ancient stars, called Carbon-Enhanced Metal-Poor (CEMP) stars. These stars contain 100 to 1,000,000 times LESS iron (and other heavy elements) than the Sun, but 10 to 10,000 times MORE carbon, relative to iron. The unusual chemical compositions of these stars provides clues to their birth environments, and the nature of the stars in which the carbon formed. In the figure, A(C) is the absolute amount of carbon, while [Fe/H] represents the ratio of iron, relative to hydrogen, compared with the same ratio in the Sun. One dominant sub-class among the CEMP stars are called CEMP-s/rs stars, represented as blue open circles (Group I). The origin of carbon in these stars is thought to be mass transfer from an evolved companion star, which produced the carbon but now has died. It is preserved on the surface of the star we observe today, but is not directly related to the very first carbon produced in the Universe. Another interesting CEMP sub-class, the CEMP-no stars (red open circles) are thought to be TRUE second-generation stars, which were born out of carbon-enriched gas clouds polluted by first-generation stars. These CEMP-no stars are divided into two apparently different groups (Group II and Group III), which are likely produced in different astrophysical sites, which the Galactic Archaeology group at Notre Dame is now exploring.